thus the name “Doctrine and Covenants”. Stereotyped beginning in 1841, Joseph “red proof” on the new edition in February of 1843, making this the last edition Joseph was personally involved with. It was printed in Nauvoo, IL in 1844, the 1845 and 1846 editions duplicate its contents (with the exception of the title page). 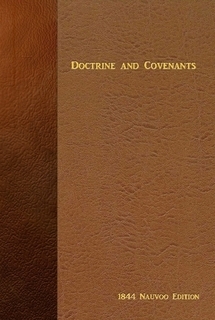 the Covenants and Commandments, originating the title, Doctrine and Covenants. This Nauvoo Press reprint edition contains two supplements located at the end of the book. The first contains a cross-reference to the substitute names that were used in this and the 1835 edition, the second cross-references this edition to the earlier Book of Commandments (1833) and Doctrine and Covenants (1835) as well as the 1981 and 2004 editions.